We have been binge watching The Sopranos On Demand. One of the most entertaining things about this show is that food is almost a character in the series. They eat when they are happy. They eat when they are stressed. They eat to celebrate. They eat to mourn. Food is a gift. It is a bribe. It is an expression of affection. And they shovel carbs all the time. I am so envious. Naturally, we started craving Italian. 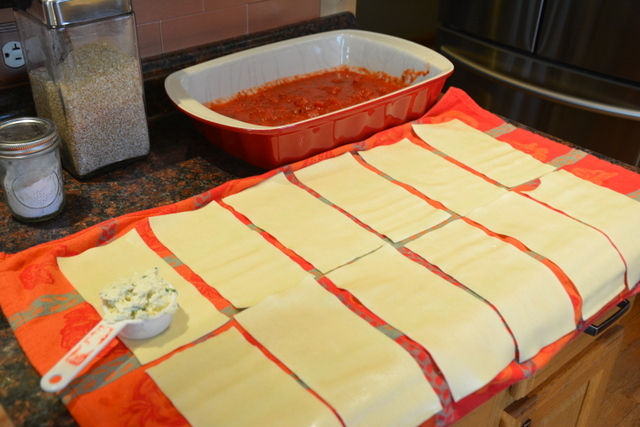 And so, for Andrew’s birthday a couple of days ago, I adapted this three cheese manicotti recipe. I jotted the original down from something I either saw online or in a magazine and unfortunately failed to record the source. But credit is certainly due somewhere for the inspiration. Adjust oven rack to middle position and heat oven to 375ºF. Heat oil over medium heat and add garlic clove and pepper flakes in large saucepan until fragrant, using care not to burn or brown. 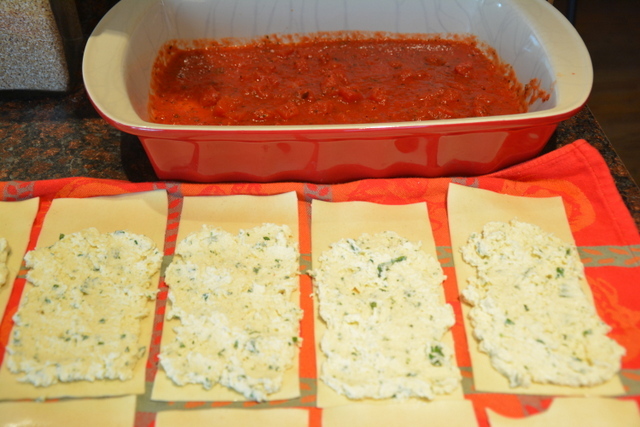 Stir in tomatoes, basil and 1/2 teaspoon salt and simmer until manicotti are ready. 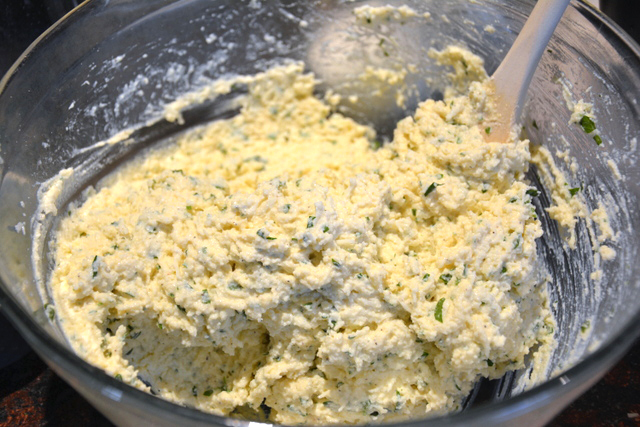 In a medium bowl, combine ricotta, 1 cup Parmesan cheese, mozzarella, eggs, salt, pepper, and herbs; set aside. To assemble, pour 1 inch boiling water into 13 by 9-inch baking dish, then add noodles, separating them as you go. Let noodles soak about 5 minutes, making sure that the noodles do not stick together. Remove noodles from water and place in single layer on clean kitchen towels; discard water in baking dish and dry baking dish. Spread bottom of baking dish with 1 1/2 cups sauce. 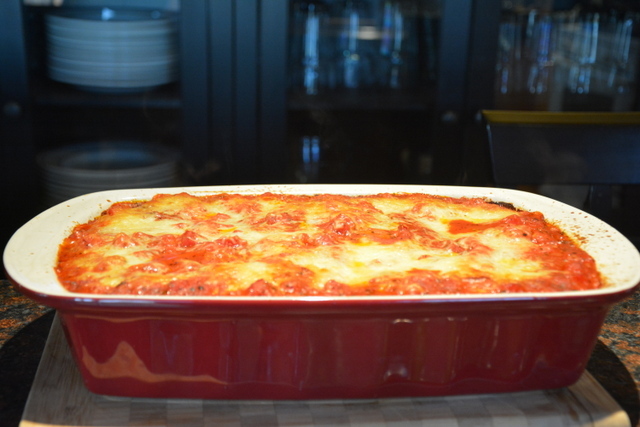 Using a large tablespoon, spread 1/4 cup of the cheese mixture evenly onto bottom three-quarters of each noodle. Roll into tube shape and arrange in baking dish seam side down. Top evenly with remaining sauce, making certain that pasta is completely covered. Sprinkle remaining cup of mozzarella cheese on top.